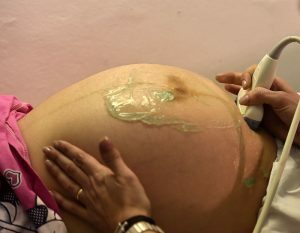 In essential terms, a breech birth is one in which a baby is born bottom first, rather than head first, according to the John Hopkins School of Medicine. About 3 to 5 percent of all women will have a baby in this position at term, between 37 and 40 weeks. 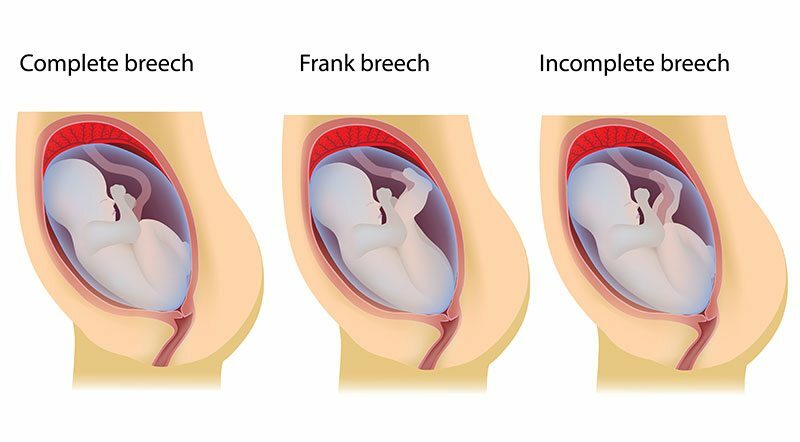 There are three types of breech births: frank, footing of incomplete and complete. A frank situation is the most common type of abnormal alignment of a baby immediately prior to birth. This type of breech positioning occurs in 50 to 70 percent of all breech presentations. It is also known as extended. This situation occurs when a baby’s legs are pulled up next to the abdomen. The knees are straight. The baby’s legs are pulled up next to the ears. A footing situation occurs when one or both of a baby’s feet are born first, before the pelvis. This type is misaligned birth is most common with babies that are born prematurely. A complete situation is best described as the baby appearing to be seated in almost a cross-legged, or cannonball, fashion. The baby’s legs are bent with the knees folded, moving the heels toward the baby’s buttocks. This is the least common type of misaligned birth of this nature, with only a 5 to 10 percent occurrence among breech babies. There are two primary reasons why an unborn baby ends up in this position at term. The proper position in anticipation of birth technically is known as a cephalic presentation. The failure for a baby to end up in a cephalic presentation can occur because of what medically is known as endogenous and exogenous factors. Endogenous factors center on the inability of an unborn baby to adequately move and get into a proper presentation. On the other hand, exogenous factors refer to insufficient or inadequate intrauterine space. The space limitation inhibits or impairs the movement of an unborn baby, preventing movement into a cephalic presentation. Other causes include too much or too little amniotic fluid, unfavorable positioning of the placenta, malformations of the child and a tight uterine wall. Even if the baby is too big, it can be in breech position. When an unborn baby is positioned as described, a Caesarian Section or C-section normally is recommended, according to the world-renowned Mayo Clinic. More often than not, when a baby is positioned in any of the manners delineated, a C-section typically is the safest way to proceed with the birth of a child. Although a vaginal birth can be possible, it is riskier for the mother and can put undue stress on and even result in birth injuries to the baby. Another possibility is to use external cephalic version, a procedure used to turn a fetus from a breech position or side-lying position into a head-down position before labor begins. Usually, this is done around 37 weeks. When successful, vaginal birth can be considered. If this method doesn´t work, caesarian section will be necessary. The sucess rate of the procedure is between 50 and 70 percent. When a woman carries multiple unborn babies, the odds of this type of birth increases significantly. The risk of a first-born twin being in a non-cephalic presentation is 17 to 30 percent. The odds of a second-born twin being in this improper position are between 28 and 39 percent. There is one caveat to the generally recommended call of a C-section when a misaligned birth of this nature is anticipated. In regard to the birth of twins, if the first one is born head first, the second twin can likely be delivered vaginally, even if improperly aligned. With the broad spectrum of prenatal testing and evaluations, a mother is well aware of the alignment of the unborn baby in advance of a baby’s scheduled birth and can take appropriate measures in time.